In many academic publications, we can find information about beneficial effects of bee products on our health. 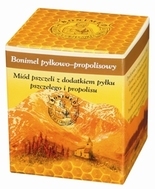 A Polish renowned scholar, Professor Bogdan Kędzia, in his numerous academic papers and his book on apitherapy, recommends eating bee pollen and propolis in recurrent upper respiratory tract infections, urinary tract infections, menopause, for enlarged prostate, liver damage, in inflammation of the large intestine. The combination of honey, propolis, and bee pollen is recommended in memory disorders caused by atherosclerosis, also for anyone exposed to chronic chemical poisoning, constantly taking chemical drugs, or tobacco smokers. So far, the anti-cancer effects of some plants have been proved basing on some studies on cancer cells and tissues or involving laboratory animals. There has been little research conducted on patients with cancer. Therefore, as of yet, we have not had enough scientific evidence, which is also consistent with evidence-based medicine, to clearly and definitely state that herbs cure cancer. We all need food, so why don’t we eat products that might have health-promoting properties, especially when doing so is safe. That is our opinion which we based on the results from research studies collected in a book on preventive care and phytotherapy (Polish title: “Profilaktyka zdrowotna i fitoterapia”) as well as on 40 years of our experience in phytotherapy.